Henry David Thoreau is an American writer. Had to study his writings in high school as part of our American literature class. His life was pretty much uneventful. Born in Massachusetts, attended Harvard College*, lived in a place called Walden’s Pond, wrote a lot of stuff. One significant bio fact is that he was “a devoted abolitionist until the end of his life” and stepped up to the plate to defend John Brown, who was still hung for his abolitionist activities despite the objections of those who supported his efforts. He died of a disease and of course, after his death, everybody decided he was a man to be praised. Posthumously, he was paid wonderful compliments such as “an original thinker”. “Henry David Thoreau Biography Philosopher, Journalist, Poet (1817–1862).” Bio.com. A&E Networks Television, 2 Apr. 2014. Web. 29 Sept. 2016. So here is one of his quotes, not found in the bio article referenced, but elsewhere on the Internet because people love to publish quotes famous people. Agree or disagree. I disagree. ~ President Barack Obama, who served as “the first black president of the Harvard Law Review in the spring of 1990”, before serving as the first black president of the United States of America. I really don’t know: you mean, if the speaker tells his word, truth or not,and the listener believe it, it will always be true. Because the listener will ratify the words of the speaker. But what if the listener disagree. Lets say the speaker tells the truth and then the listener do nut believe; does that mean the there was no truthfulness in the words of the speaker. Hmm, there might be a reason why David quote this. 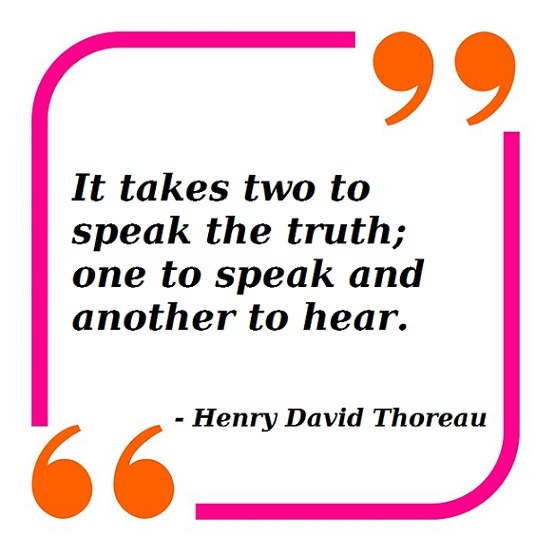 I strongly disagree and my reason is this: Firstly, communication is a two-way process; give and take of communication where one serves as speaker and the other one listener. Each one must refute each other about a particular issue and vise-versa. Each must have their proofs to prove what they say are true.If the other one cannot prove, therefore, he losses the argument.